“Parsimonious” means being frugal to the point of stinginess. It means you believe that if you open your hand to give something away, then you’ll never get it back. So you keep the fist closed—nothing gets out. But there’s a negative flipside—nothing gets in. A parsimonious worldview is like when my youngest daughter insists on going to bed with multiple pacifiers—a backup for a backup for a backup for a backup. The other day, I saw her walking around the house with one pacifier in her mouth, two in one hand, and three in the other. That’s six pacifiers! Just in case, I suppose. But don’t laugh; adults do the same thing, it just looks differently. The world God has made is not a parsimonious world. Christians, of all people, should know this. God created the world not out of need, necessity, and deficit—but overflow. God didn’t need, he overflowed. And believing this (or not believing this) affects how you live, which in turn, of course, affects how you write. Therefore, if you think of a gem of a phrase, metaphor, sentence, or paragraph, then give it away. Don’t go walking around with one pacifier in your mouth and five others in your pocket—just in case. Yes, storage and planning are commendable things, but when we hoard, we say something about our view of the universe and the God who created it. This week, I thought I’d share an extended quote from Douglas Wilson, a favorite author of mine. In the quote, he says a similar thing. Enjoy. “If a striking expression hits you, don’t hold back just because you are writing an email to your sister. If you think, ‘I need to save that kind of thing from my memoirs,’ you are a stingy writer with a heart like a walnut and you won’t have any memoirs to save it for. Who wants to read the Memoirs of Old Walnut Heart? “Writing ability is a developed and honed skill, and the more you develop and hone it, the more that you will have. Writing as well as you can in every setting is the way to have reserves to draw on when it comes to writing for publication. Pianists don’t have a limited number of C major chords they’re allowed to play in the course of their lives. They aren’t afraid of running out. 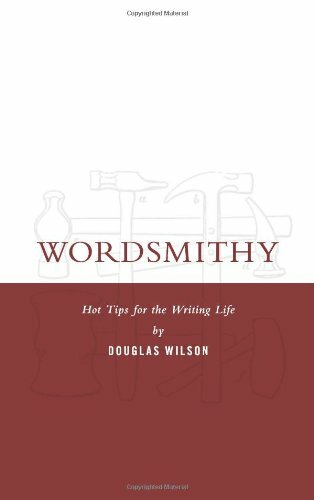 “Writing is not a zero-sum game, and so you shouldn’t be afraid of using up all of the colorful adjectives. Extending yourself in any situation is the best way to be able to extend yourself in every situation.